Hi friends! I hope you're having a fabulous week! I'm doing ok. I still have some coughing. Tomorrow, is my Brady Bug's promotion from preschool. I'm a bit emotional already. :( He's getting so big! Here's a card I made for a call that wasn't picked up. You win some you lose some. Or a lot. What can you do? 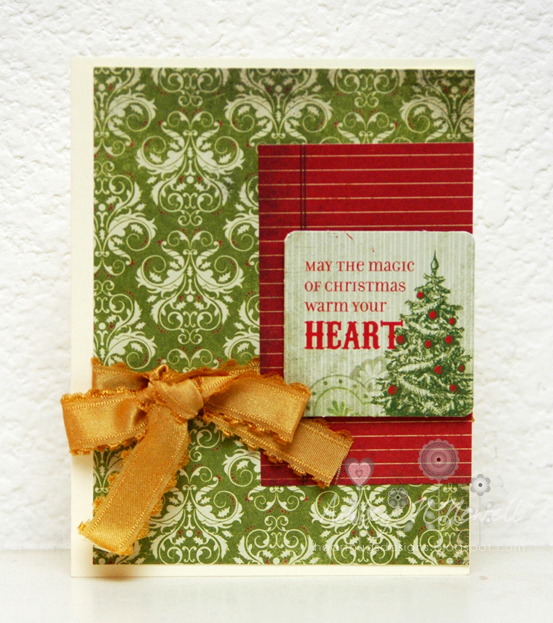 This card was made with Authentique Wonder and accented with some pretty May Arts ribbon. Very simple. I think this is absolutely beautiful, Ashley! Sometimes I'm really surprised at the cards that are passed up compared to some that I see published. To me, this one is definitely pub-worthy! Hope you are feeling better very soon, and congrats to Brady! This is beautiful, Ashley! Thanks so much for stopping by during the Paper Smooches July Release Hop!